ISLAMABAD: Amid growing concerns over the alleged disappearanceof a number of social media activists linked to the ruling party, Interior Minister Ahsan Iqbal on Tuesday announced plans to formulate a framework to monitor social media in order to prevent it from being used as a tool to malign national institutions and spread anarchy or extremism in the country. “The Federal Investigation Agency (FIA) has been directed to formulate a framework for social media monitoring in consultation with all stakeholders,” the interior minister said at a press conference. 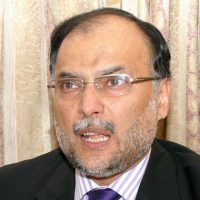 Mr Iqbal termed social media an important weapon of fifth-generation warfare, which was being used to destabilise societies and create anarchy in countries, saying that even in the US and Germany, there was an ongoing debate over the misuse of social media in the recently-held elections in both countries. Last week, his party chief Nawaz Sharif had issued a rare statement in support of the missing activists and called on the interior ministry to ensure their immediate recovery. However, at Tuesday’s presser, Mr Iqbal did not give a direct answer when asked about the fate of the missing men. “Since we are entering an election year, there is a need to formulate a framework that maintains democratic freedoms and ensures that no foreign hand or saboteur can use social media to create political chaos, spread extremism or carry out terrorism in Pakistan, or belittle national institutions,” he said, highlighting the main objectives of the proposed framework. He said that social media was being used as a deadly weapon “to discredit and destroy leaderships and state institutions and promote conflicts through fake news”, and stressed that like the armed forces and the judiciary, parliament was also a national institution. “Parliament is as sacrosanct as the armed forces and the judiciary,” he said, expressing his displeasure over the ongoing campaign to defame democracy and the legislature. However, he said, the people’s right to express their political views would be respected. In a democracy, he said, everyone had the right to express his viewpoint on any political issue, but “unbridled freedom on social media can cause anarchy”. Mr Iqbal also announced that his ministry had decided to allow anyone to import or buy bulletproof vehicles after paying the relevant taxes to the government. “If anyone wants to have an expensive vehicle, he can get it, but only after paying tax,” he said, adding that they had fixed a tax of Rs500,000 for such vehicles. Previously, he said, genuine applicants such as diplomats, businessmen and parliamentarians who faced security threats had to wait months for a licence. “Now anyone can obtain the licence in 10 to 21 days, if there is no criminal case against him or his name is not in the negative category,” he added. The interior minister also announced that “foreign spouses” of Pakistanis would again be issued Pakistan-origin cards. He said that he had received complaints from a number of Pakistanis about a “sudden ban” on the issuance of the cards for the spouses of Pakistanis, creating problems for them in the purchase of properties and other transactions. The minister also criticised religious parties and groups that had announced to march on Islamabad in connection with the recent controversy over the change in the Khatm-i-Nabuwwat Declaration for electoral candidates. Mr Iqbal said that since the issue had already been resolved, there was no need to hold this protest, expressing the hope that those groups would cancel their protest. The interior minister also lashed out at Pakistan Tehreek-i-Insaf (PTI) chief Imran Khan, calling him the head of a “Destruction Brigade” that could not bear to see the country progress. He claimed that disgruntled politicians wanted to derail the democratic process before March next year, when Senate elections are scheduled to be held, vowing that the present assembly would complete its five-year term and the next elections would be held in the first week of August 2018. Referring to the leak of an interior ministry letter regarding the provision of security to the Chinese ambassador, the minister said that an inquiry into the circumstances surrounding the leak had been ordered, and advised the media to exercise editorial restraint when reporting on matters related to security and foreign relations.